BERNINA OF AMERICA encourages great customer service found in local BERNINA dealerships. BERNINA Sewing, Etc. strives to provide the best possible customer service possible. While you will find Unilateral Minimum Resale Prices on the web, always check with BERNINA Sewing, Etc. for special pricing. Set the over-edge thread length - at the twist of a knob. A serger with a chainstitch, four coverstitches and four combination stitches chainstitch/overlock stitch). The hard-wearing safety seam (combination stitch) is ideal for reliably joining firm woven fabrics, such as jeans. The 3- and 4-thread coverstitch gives you an especially durable, flat stitch in highly elastic fabrics. 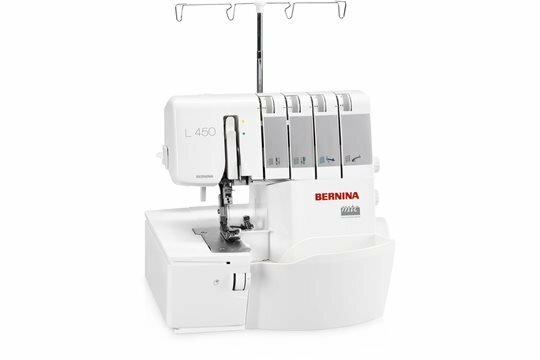 The BERNINA lay-in system lets you thread quickly and directly - and it’s also simple to thread the lower looper, thanks to the automatic lower-looper threading system. Easy, ergonomic operation: With the aid of the vision panel and the red position indicators, you’ll find the ideal position of the needles and lower looper for threading straightaway. Working with an overlocker/serger sewing speed of up to 1,300 stitches/minute means saving time. Sewing projects take shape quickly and with little effort. 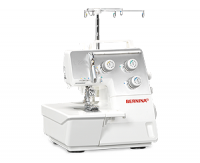 Innovative features make BERNINA overlockers/sergers delightfully easy to use, ensuring professional quality down to the last stitch. The overlocker/serger is a perfect companion to the sewing machine as a specialist in coverstitch and chainstitch. For more information, click here.